Eastgate Business Park is a 33 acre parcel that will that will facilitate the growth that Moosomin’s business sector is going to experience over the next few years. It is zoned C-2 Commercial which can encompass businesses ranging from motels, to restaurants to service stations and many others in between. Our Town Council is very progressive and willing to work with any business that wishes to establish in Moosomin. 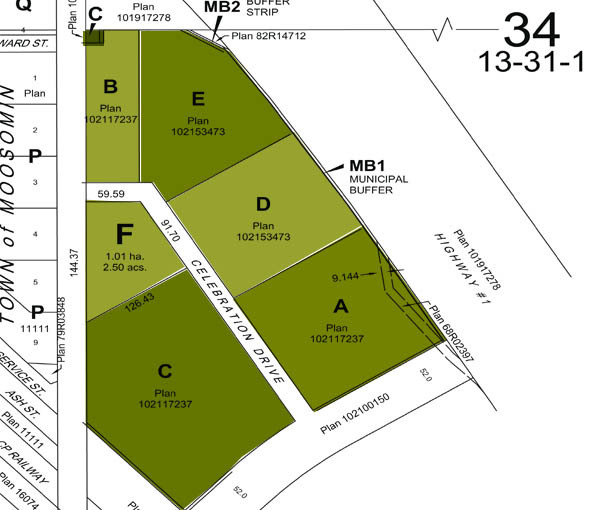 The initial design has the property subdivided into 3 parcels. A service corridor (in the shape of a hockey stick) intersect the property, in a generally east to west direction. The service corridor will include the main street as well as the main services---domestic sanitary sewer, water, hydro, natural gas and telecommunications. Street lighting and fire hydrants have also been built into the concept. The parcels will be further subdivided to meet the specific needs of the businesses locating in Eastgate Business Park. Subsiduary streets and services will be designed to best serve those businesses while protecting the integrity of the development.